Frozen Huckleberries For Sale Here! You can buy Fresh Huckleberries Here! Fresh Huckleberries must be shipped overnight. 5 lbs of huckleberries equals 1 gallon. There are 1 1/2- 2 Cups of Huckleberries per pound. We have frozen huckleberries year 'round. They are coastal huckleberries and mountain huckleberries. Mountain berries are a bit bigger and on the sweeter side. The coastal berries are more on the tart side and smaller. Depending on where they grow will impact the size. Huckleberries are very small to start with, much smaller than a blueberry, even though they are a member of the blueberry family. Montana Huckleberries, Idaho Huckleberries, Washington Huckleberries and Oregon Huckleberries all differ greatly in flavor, but you will love all of them! If you are concerned about them being too tart, we recommend you mix them with the mountain berries. 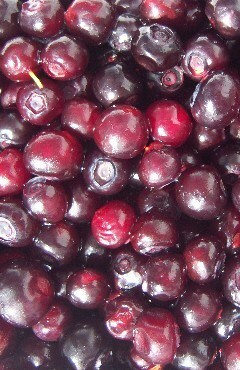 Huckleberries are very good for you, and are great by themselves, in shakes, in stuffing, as a topping for many foods. Find Frozen Huckleberries here.